Back in 1996, Governor Bill Weld wanted to be Senator. John Kerry was running for his third term. Amidst the clash of blue-blooded New Englanders, Weld decided it would be a great political coup to remove tolls on two sections of the Massachusetts Turnpike. So he zeroed out the tolls in Western Mass (which mainly required new tickets—yes, that was pre-EZ-Pass—as the highway still required toll barriers; the tolls were reinstated last year to little fanfare) and nixed the toll in Weston Newton. While the Western Mass tolls were a quiet affair, the West Newton tolls were less so. Overnight, signs went up: Toll Free. One day when I was biking home from middle school (yes, middle school, and yes, I was a commie bicyclist even then!) I noticed a peculiar sight: a backhoe was tearing in to the old toll booths, and within a few days they were gone, paved over would never be seen again. Of course, this was a transparent political ploy, and it soon surfaced that Weld hadn't publicly bid the demolition contract but instead given it to a friend. He lost the election by seven points. Much of the traffic coming east on the Turnpike originates on Route 128. When the Southwest and Northwest expressways were canceled, the Pike became the only western trunk route in to the city. 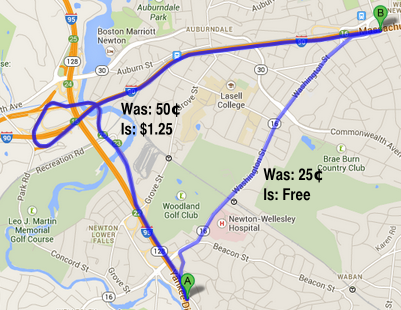 Up until that point, the toll to access the Turnpike at 128 was 50¢, and in West Newton it was 25¢. Traffic from the south on 128 has little incentive to stay on 128 to the Turnpike, as the diagonal Route 16 is two miles shorter and, even with traffic lights, negligibly slower, especially given the roundabout design of the 90/128 interchange, where Boston-bound motorists drive half a mile due west before swinging back east through the toll gates. Until 1996, there was a 25¢ difference between staying on the highway and taking the surface roads. In 1996, the savings went to 50¢, and when tolls were raised in 2002, to $1.00 (it stands at $1.25 today). This was a four-fold increase in the direct cost savings over those six years, and there was suddenly a much higher incentive to take the Route 16 shortcut and save a dollar. And guess what happened on Route 16? Traffic tripled, and gridlock ensued. Exit 16—coincidentally, where Route 16 intersects the Turnpike—was never anticipated to be more than a local access exit. It has a short acceleration zone and a very short merge with poor sightlines around a bridge abutment. And it began to handle far more traffic than it had before. (On the other hand, the outbound ramp no longer required vehicles to slow through the toll plaza, and they frequently merged in to Washington Street at highway speed at a blind corner with significant pedestrian traffic.) With more cars coming off of Route 16 rather than the main line, it created a merge which caused traffic back-ups a mile back Route 16, and—given the merge—also backed up traffic on the mainline of the Turnpike. Additionally, drivers who may have, in the past, stayed on Route 16 between West Newton and Newton Corner instead used the free segment of highway, adding to the traffic along the Turnpike and causing more backups at the short exit ramp there. One shortsighted, unstudied policy change changed the economic decisions of drivers on several segments of road, changed the equilibrium, and caused several different traffic jams. And the state lost money, to boot. So the new electronic toll can't come soon enough. It's too hard to tell if it will rebalance the traffic, or if growing traffic volumes in the intervening 18 years have created this traffic in any event. But it will finally correct a problem nearly two decades in the making by a governor trying to score political points; a problem that never should have occurred in the first place.